A Belgian motorist was left stunned after authorities sent him a speeding ticket for travelling in his Mini at three times the speed of sound. The ticket claimed the man had been caught driving at 3380 kph (2,100 mph) - or Mach 3 speed - in a Brussels suburb, a Belgian newspaper reported. 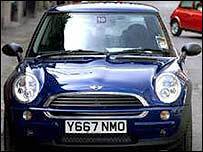 However, police later admitted that a faulty radar had been responsible for the Mini's incredible feat. The police have since apologised to the man and promised to fix the radar. The incident took place in December, but only came to light when Belgian prosecutors were asked to follow up the unpaid fine. "We called the local police to find out what height the plane caught speeding along the Boulevard Lambermont was flying at," a member of the Brussels public prosecutor's office joked to Belgium's La Derniere Heure newspaper. Police also said they had made a mistake in still sending out the ticket, given that it was impossible - even for a doughty little Mini - for a car to have travelled so fast.